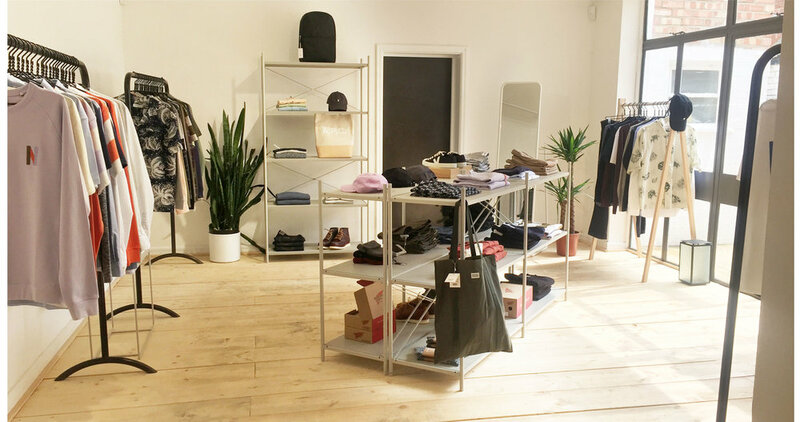 The Union Project – independent menswear and lifestyle store – has reopened in a new and larger space in Cheltenham. The store offers a finely curated selection of clothing and shoes along with lifestyle items that are simply displayed in this bright and welcoming new venue. Concrete is used to form the till and coffee point, where customers are welcomed in with hand roasted coffee. Behind the till, an ambiently lit aperture within the white brickwork wall holds a condensed and curated selection of the product offering. The Union Project presents a unique and minimalistic shopping experience – featuring a raw wooden floor finish and simple display fixtures, allowing the products to speak for themselves. The muted palette of materials ensures a neutral but well considered backdrop. White painted brickwork and raw concrete finishes throughout the space are accented with a variety of leafy plants and colourful product. The elongated space features floor to ceiling windows at both ends. This allows light to flood into the centre of the space. The grey window frames to the back of the store give an industrial feel, providing an interesting contrast to the rest of the space which feels bright and airy. The pared-back nature of the interior reflects the functional nature of much of the product featured, and the brand identity. On entry all areas of the store can be seen. This encourages customers to journey through the space and browse the product offering. Raw timber with integrated down-lighting is used for shelving, and a white ladder is used to access stock further up the shelves. Simple rails with concrete bases are used in other areas for hanging items. The simplicity of the store successfully accentuates the minimalistic and high end range of clothing and shoes offered. Moving from a considerably smaller space closeby in Cheltenham, the new store is a great extension to the brand story and we really enjoyed our visit. Since the move in March, the smaller space has been repurposed to host another new venture for the company – a store exclusively to feature the home and lifestyle product range. Both stores are fantastic additions to Cheltenham’s shopping quarters. We’ll definitely be back!